Dear editor, I just entered a micro-video contest recently and won a third prize. I am so excited about it that I would like to burn it into a Blu-ray to preserve. Therefore, I hope I can find a Blu-ray burner that is able to perform the best quality of my video. Is there any Blu-ray burning application may satisfy my requirement? Would you give me any suggestion? Click on the “Add Video” icon to browse videos on your computer and then load those you want to burn to Blu-ray or DVD disc into the software. Or you only import videos via direct drag-and-drop. This Blu-ray burner allows you to add external subtitles to video and you can also make a selection on audio channel. The loaded video files could be displayed in thumbnails or details. After loading, you could select display method; play back loaded videos, select subtitles and audio tracks, etc. 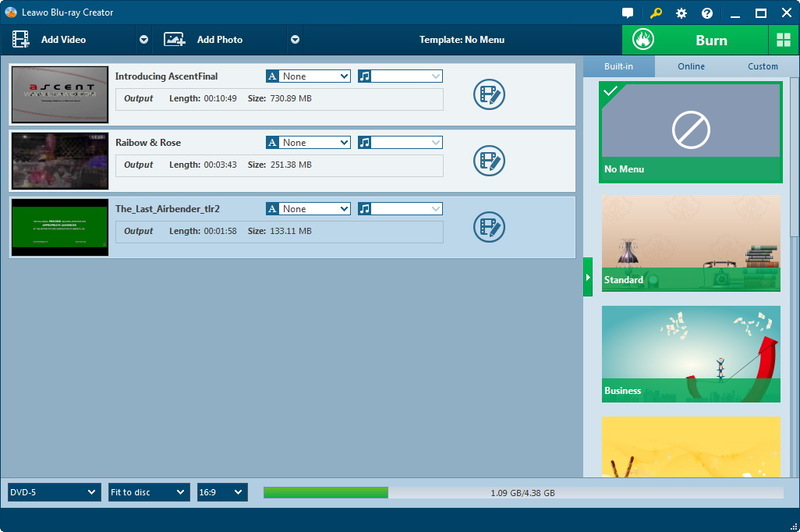 Choose a disc menu on the right side of this Blu-ray Creator for output Blu-ray movies. You could select from preset models or custom disc menu as you like. You could preview selected disc menu, DIY disc menu and then click “Save Template” option to save custom disc menu into “Custom” group. Click “No Menu” option on the disc menu selecting panel if you need no disc menu. Choose to burn to DVD-5/DVD-9/BD-25/BD-50, and set aspect ratio as 4:3 or 16:9 (when burning to Blu-ray, only 16:9 is available), and select quality in “Fit to disc” at the bottom of the main program interface. Space needed for Blu-ray or DVD burning can be accessed. Click the big green “Burn” button on the top right corner to invoke more burning settings, including Burn to, Disc Label, Save to, etc. Click the “Burn” button at the bottom of the burning settings panel to start video to Blu-ray/DVD burning. This Blu-ray Creator would then carry out the burning processes one by one. On the Burning interface, you could view the burning progress and do after-done settings. Hope this article will be useful for you. 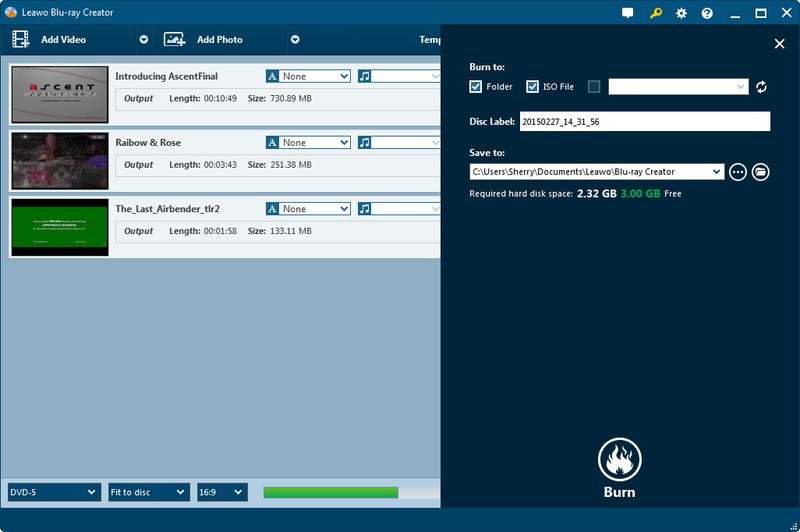 If you would like to know more about Leawo products, this article “How to Back Up Blu-ray Collection with Leawo Blu-ray Copy” will help.